My oldest daughter will be turning 8 this year and she is the most loving and friendly girl I know. Her personality is contagious and she will always leave you feeling happy after you spend some time with her. With the hardships of school, friends, and siblings, sometimes she is left feeling defeated and some of her happiness diminishes, which causes sadness and weakens her self-esteem and confidence. As a parent, it is never easy seeing your children get upset or feel unloved. For Bailey, I feel a little more guilt when she doesn’t see how special she is because she was the middle child for so long and at times falling into her other siblings’ shadows. Glossy Chick is a children’s clothing brand that caters to girls between the ages of 2-12. Their collection of clothing and accessories includes a variety of fashion forward pieces, giving young fashionistas a sporty casual yet trendy look. Designed in the heart of New York City, Glossy Chick focuses to provide great comfort in their apparel using the finest authentic Peruvian Pima Cotton and is hand-crafted in Peru. One of the unique things about Glossy Chick is the VIP Chick Club®. By becoming a member of the VIP Chick Club®, your fashionista will receive a monthly package with a charm, shirt, and a pouch as long as you maintain your monthly account premium. The club also provides its members with a full array of events, monthly gifts, prizes, and above all, a unique platform to build friendships, character and confidence through engaging contests. Members are instantly eligible to earn points and redeem them for the trendiest Glossy Chick merchandise. Glossy Chick provided me with this VIP membership to share my opinions with you. I am not required to give positive feedback, but to be honest in what I have reviewed. The opinions stated in this posting are my own. When Bailey’s first VIP Chick Club® package arrived at our house she was so excited. I told her that this was a special gift just for her, and that she would be getting a box with clothing and accessories in it each month. Her face lit up with joy. I could tell instantly that the VIP Chick Club® was going to be something she will cherish and have to help boost her self-confidence and self-esteem. Knowing that she will be surprised each month with something new and unique to wear that is just hers feels priceless to me. Her happiness is what is most important, and with the items she received in her welcome package, I have already seen how special she feels. She wore her “Glossy” shirt to school and came home beaming, as she recounted the stories she told her friends and teachers about being a new Glossy Chick and about her new jewelry box and bracelet. The jewelry box is very beautiful. 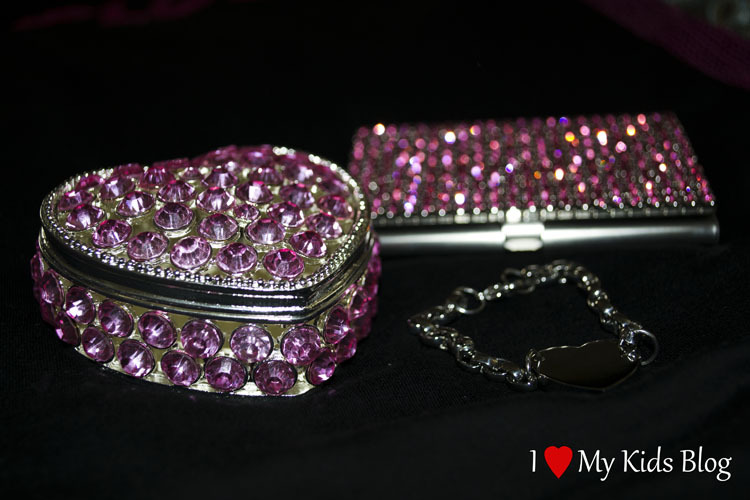 Covered in pink rhinestones, its elegance and simplicity make it a great center piece and safe-haven for the bracelet she also received. Each month, as she continues to get the VIP Chick Club® packages, she will be able to add charms onto her bracelet and the jewelry box will be even more essential as her collection grows. Another item in the welcome package was a card holder. At first I wasn’t sure what the purpose of it was, but then upon researching a little more, I realized it is for a Glossy Chick membership card. The welcome package Bailey received did not have a membership card in it, however I have since contacted the company and have been notified of its shipment. In the meantime, she has enjoyed making cards and putting them in it and using it as her imagination soars during interactive playing with her siblings. Lastly, the “Glossy” shirt in the package was a perfect way to show Bailey how fun fashion can be. With bright pink sequins all over the shirt, there was no denying how special it made her feel. When the light hit the sequins it shimmered and shined. The shirt is very soft, and fits her body perfectly. I love how happy she is wearing it. Enjoy this video of Bailey opening her welcome package from the VIP Chick Club®. She can’t wait to show you what gets next month. « 10 pictures that will make you laugh out loud today!